The Roche Computing education gets pupils excited about technology and its possibilities. 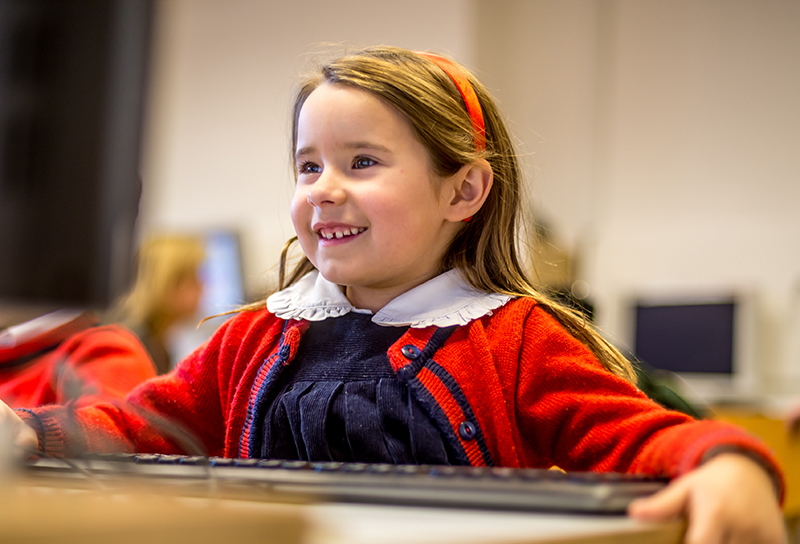 Pupils are initially equipped with the skills needed to explore technology efficiently before moving on to other key skills such as word processing, search and more specialised computing skills. The syllabus also addresses E-Safety and the role of technology in their personal lives. Computing in the Early Years and Foundation Stage involves using technology creatively; children use technology as a tool to help them explore and observe things about their environment. Children learn to make remote control toys move by entering simple commands. They also begin to learn keyboard and mouse skills as well as key terminology. The children learn keyboard and mouse skills that enable them to produce short pieces of text, sometimes with illustrations from clipart or images from the internet. They also learn to use search engines to locate information and pictures for topic work. In Reception, the children learn to make remote control toys move by entering simple commands. This is followed up in Years 1 and 2 with Microworlds Junior, an introduction to basic programming. Pupils investigate simple troubleshooting alongside touch-typing and word processing. Key Stage 2 continues to focus on computer literacy. Pupils use search tools to find information and develop an ability to judge its relevance. They start to use their Microsoft Publisher and Excel skills to support their other subjects. They are introduced to coding which is further explored in Years 5 and 6 where they look at complex algorithms in programs Scratch and Lego Mindstorm. Alongside this, they come into contact with the modelling software Google SketchUp. Year 6 investigate how to use scale and various tools to build scale models of buildings and objects. Online safety is a large aspect of computing in Key Stage 2. As technology is integral to our lives, it is essential we teach proper use as opposed to restricted use. We focus on digital presence and equip pupils with a strong sense of responsibility, as well as the ability to recognise and deal with acceptable and unacceptable behaviour. Each module establishes learning objectives and the pupils' progress is monitored by success criteria. Informal, formative assessment takes place every lesson and each pupil receives feedback. Having personalised goals and regular feedback allows the children to become independent learners who take responsibility for their own learning. Clubs relating to computing include Film Making and Roche Robotics. Furthermore, there are council-run challenges as well as opportunities for pupils to use their computing knowledge to help them create projects relating to other subjects or outside interests.